The words to the right on this sign reading Iron Works are reasonably clear. Much more obscure is the faint remnants of Kues Brothers on the left. 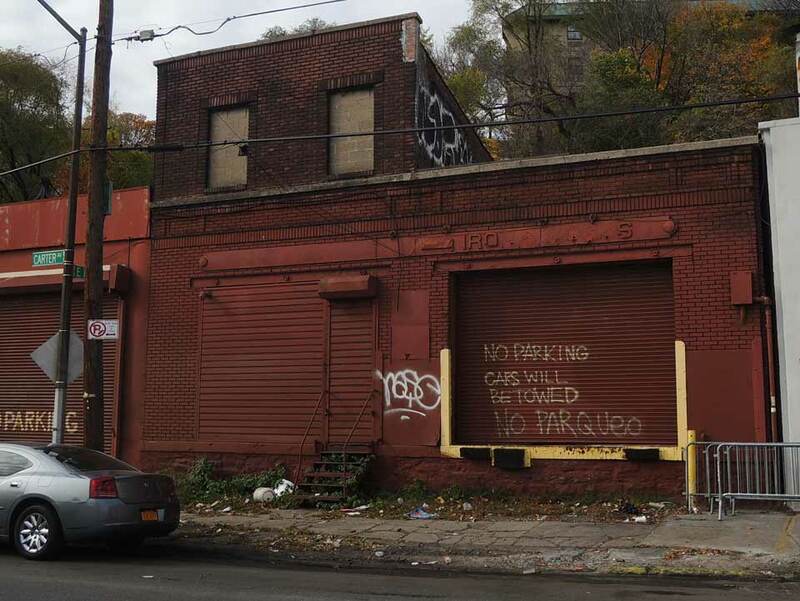 This derelict building on Carter Ave. on the corner of East 175th Street, the Bronx, was in fact the home of Kues Bros. Iron Works from 1905 through 1928. The Annual Industrial Directory of the State of New York, 1913, described Kues Brothers at Carter Ave. and 175th St., as "structural and ornamental iron," with a total of 29 employees. This was, then, a modest but successful business for its twenty five years of existence. Proprietors were the brothers, Herman Kues (1871-1945) and Otto Kues (1879-after 1942). They were immigrants from Germany in the early 1880s. Herman Kues' naturalization petition dated 1892 says that he was born 2 September 1871, that he arrived in the U. S. 12 May 1884, and that he lived at that time at 131 Ave. B, New York City. In the 1900 U. S. Census, the two brothers lived together at 174 East 106th St., Manhattan. Herman Kues was 28 years old, married with a son, Henry, age 3. Otto Kues was 21 years old. Both described their occupations as "Iron Worker." In 1918 Otto Kues registered for the World War I draft, age 39, born 6 Feb. 1879, citizen by father's naturalization. He lived at 2081 Crotona Ave., the Bronx, and was self employed, "Iron Works," at 1805 Carter Ave., the Bronx. Both Herman Kues and Otto Kues appear in the 1940 U.S. Census. Neither was employed in iron work any more. Herman Kues was "Estimator, Construction Co.," and Otto Kues was "Painter, Odd Jobs." When Otto registered for the draft in 1942, he was 63 years old, unemployed, and lived at 1170 Throgmorton Ave., the Bronx. Years later, in 1963, a classified ad in the New York Times, offered iron works tools, etc. for sale from the building above: "Iron works tools, 2 welders, drill presses, sm power punch with motor elect drill, elect hoist, block and chains. 1805 Carter Ave, Bx. LU 3-4140, eve TR 2-0810." Coal chute covers manufactured by the Kues Bros. are found in the manholes section.